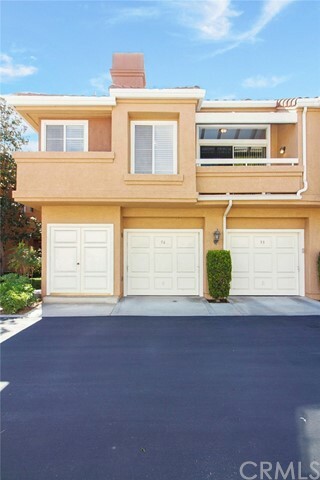 Beautiful 2 Bed/2Bath Lake Forest condo in a private gated community on a private lake. Plenty of windows provide lots of natural light to fill the large living room and kitchen. Vaulted ceiling in the bedrooms and high ceilings in living room really give the unit a wide-open feeling. There's a big master bedroom with walk-in closet, and plenty of room on the balcony for friends and family to enjoy. You won't have to worry about noisy upstairs neighbors because there is no one above this unit, and only garages below. There is wood style tile throughout the living room and bedrooms, and carpeted stairs, which have been recently installed. The A/C and heater system was completely replaced in 2015 with an energy efficient model, and there are laundry hookups inside the unit. Unlike other units in this complex, this unit comes with a direct access one-car garage with storage, and another permitted parking spot just steps from the front door. HOA pays for water and trash service, there is a pool and dog park inside the community, and the HOA has more amenities like a private beach and three more pools, spas, gym, game room, volleyball court, tennis court, and a bar. The HOA recently installed PEX piping for the supply lines in every condo, which the current owners already paid its $8,000 special assessment in full!